Managing dog-dog resource guarding in the home is always a bit of a challenge. When you’re a foster family for a rescue or shelter, you’re constantly dealing with dogs that come in and out of your home. While some dogs share well, others are uncomfortable allowing other dogs near their food and toys. Having problems with managing dog-dog resource guarding? Purchase our e-book, Practical Solutions for Aggressive Dogs, now! My foster dog has a bit of resource guarding with other dogs in the house (not people) we’ve been working on it, but one thing I noticed is that when Spot or Bonnie chew on a bone, which we just put back on the ground this week, she gets in their face and stares at it. No growling from either party and Bonnie and Spot keep on chewing as Lady just stands there staring. I’ve been redirecting kind of without thinking about it, but wondering if that’s what I should be doing? I know most dogs wouldn’t put up with her behavior. Should I just withhold bones again, or continue the practice? She’s meeting a family with kids and a rather submissive dog tomorrow and I’m nervous. We’re glad you asked! You’ve done a good job of identifying a common problem in your home. Luckily, it sounds like Lady isn’t about to cause damage to the other dogs in your home. However, you’re spot on when you say that you’re worried that other dogs might not be quite as patient with Lady’s (slightly rude) habits! The short answer: keep doing what you’re doing. Managing, redirecting, and training are your three steps to managing dog resource guarding. Lady’s behavior is a bit rude, so interrupting her is a good idea. This will be especially important if her new house-mates give her the bone when she stares. We don’t want the other dogs “training” her in this behavior! 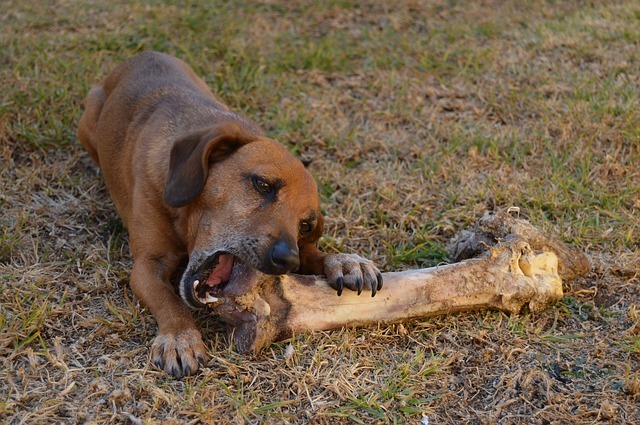 Dogs that aren’t good at sharing their food, toys or resting spots are doing what we call “resource guarding.” This blanket term includes dogs that stiffen, growl, snarl, or even bite around objects of value. This is a totally natural behavior, but can also be quite dangerous and frustrating! 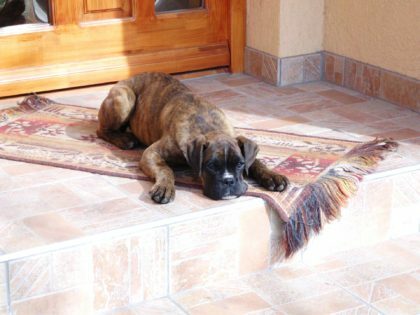 With good management, dog-dog resource guarding is a behavior that doesn’t have to be a nightmare to live with. Many dogs that resource guard also get a bit stiff when other dogs have things of value. It sounds like this is Lady’s main problem, probably because “Concerned in Kenosha” is a skilled dog foster who keeps the other dogs from trying to steal treats from Lady! In this case, I would teach Lady to disengage from the other dog and pay attention to me. This will help her learn an appropriate way to get treats. If she just wants what the other dog has (not what I’m offering), I’d separate the dogs while they eat and chew. Step 1: Keep an eye on it. Learning exactly what she guards against other dogs when is extremely important. For example, my dog Barley will growl at other dogs if they try to get near tasty treats, but he’s fine sharing toys. Other dogs are fine sharing food but growl when dogs come near their sleeping spots or “their people.” Learn your dog’s patterns – document them if you can! 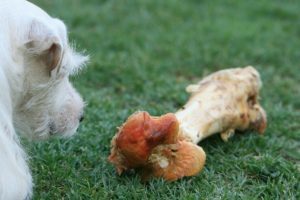 If your dog is dangerous around food or toys, don’t spend time watching for patterns. Go straight into management mode for everyone’s safety, and reach out to me for help. Step 2: Remove objects of value. Once you’ve documented what, when, and from whom your dog guards, you can take control of the situation. If your dog guards food that’s on the ground, don’t store your dog food on the ground. If she guards bully sticks against other dogs, separate the dogs when they’re chewing. If she growls at other dogs when they approach her on your lap, teach each dog to move somewhere on cue so that you can keep a safe distance between them. Teach Lady to look at you when you say her name or “watch,” then practice this in increasingly distracting environments. When Lady starts to stare at Spot or Bonnie, quietly call her name and reward her when she turns to look at you. You can also do this to help the other dogs disengage from Lady! This helps you interrupt the dogs if they’re fixating or about to fight over a treat. Step 4: Teach Lady to lie on a mat. Lady might simply struggle to leave other dogs alone when they have high-value objects. This is common in dog resource guarding. Teaching Lady to lie on a mat will allow you to easily separate the dogs while they chew if you don’t have baby gates. Then you can use mat training to send Lady, Spot, and Bonnie away from each other while they eat. Step 5: Get help with counter-conditioning and desensitization. Treating dog resource guarding can be a bit tricky. Teaching Lady that other dogs eating is good, and other dogs approaching her while she eats is no big deal isn’t going to be easy. In many cases, good management and redirection (Step 2 & 3) are all you need. But if you want to get help changing Lady’s emotions around sharing, you can get help. Please reach out to me for help. You must practice in a safe environment (using leashes and baby gates). Then you can reward Lady with awesome treats or space for ignoring the other dogs. This training setup takes some practice, so set up a phone call with me for help if you want to go beyond management and redirection!